Banks are coming off their worst week since 2011. The KBE bank ETF fell 9 percent last week, while the broader-based XLF financial ETF tumbled nearly 5 percent. Bank stocks are now in a bear market, having fallen more than 20 percent from a June peak, while the financials tumbled into a correction with losses of 13 percent from their 52-week highs. It could get even worse for the financials sector, says Craig Johnson, chief market technician at Piper Jaffray. "We're still underweight financials at this point in time," Johnson said Friday on CNBC's "Trading Nation." "We're still making a series of lower lows and lower highs in here, and from our perspective the recent price action since December has been nothing more than a relief rally." 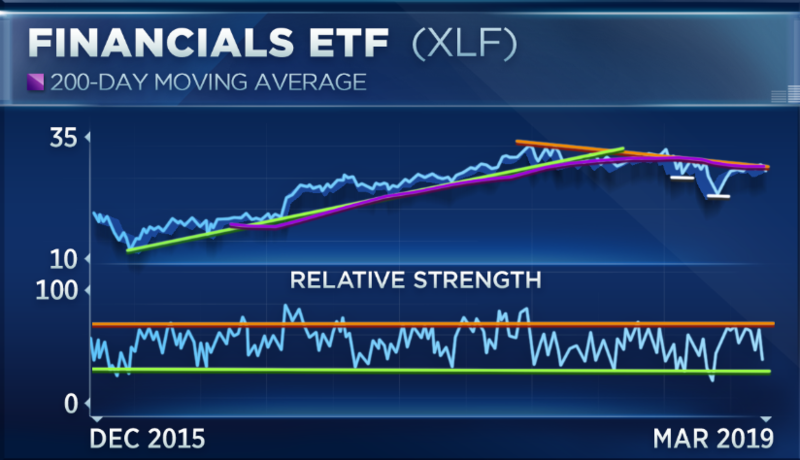 The XLF ETF had rallied 15 percent since hitting its bottom in late December. Some of its individual components have fared even better — Citigroup is up 26 percent, American Express has gained 23 percent and Bank of America has added 19 percent. "We're not interested in the banks. You look at a lot of these individual company charts, again they also look like relief rallies, and they look like they're about to roll over, and the yield curve is still very concerning and a headwind for the banks," said Johnson. Michael Binger, president of Gradient Investments, is also steering clear of financials. "The underperformance of the banking sector has really started to accelerate since the Fed went dovish," Binger said Friday on "Trading Nation." "Banks make money by making loans, so if the Fed is seeing a weaker economy possibly, then loan growth is going to be tough." At its meeting last week, the Fed sounded a dovish call by suggesting it may not raise rates at all this year. The central bank has been cautious in tightening monetary conditions too much in the face of slowing global growth. "The spread they're going to make on the loans they can give out or will give out is going to be compressed, so banks are going to struggle and be quite challenged for growth," said Binger. The sell-off in financials picked up speed on Friday after the yield curve between the 3-month and 10-year Treasury note inverted for the first time since 2007. An inverted yield curve squeezes bank profitability and is seen as a recession indicator. "We will stay underweight the classic banking sector. We are going to be very selective in the stocks we pick and we would much rather play in the fintech area — companies like Global Payments, PayPal, Visa and Mastercard," Binger said. Each of those companies have rallied by double digits in 2019, more than double the gain on the XLF ETF. Disclosure: Gradient Investments has positions in GPN, PYPL, V and MA.